We understand how important your pet is. New patients should visit New Patient Center tab above. Welcome to Best Friend's Veterinary Center! 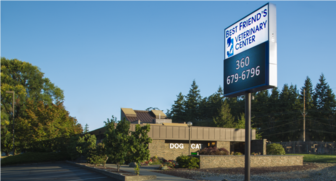 Best Friend's Veterinary Center is an AAHA accredited veterinarian hospital that provides preventative, medical, surgical, dental, orthopedic, and hospitalized care for your dog, cat or small animals. Best Friend's Veterinary Center is dedicated to providing warm, loving, knowledgeable care for companion pets. We invite you to stop in and have a behind the scenes tour of our award winning facility. We think you will be delighted to see the level of care an American Animal Hospital Association hospital can provide. "Wow! Thanks to all the staff at Best Friends Vet Clinic. I feel like you all truly love what you do! My kitty, Lola and I always have such a pleasant experience when we come in. Fortunately, it’s usually just for a check-up, but I would not leave Lola in anyone else’s hands but yours. Thank you for your caring commitment"
"I'm so glad I chose to bring my cats here when I moved to Oak Harbor! The entire staff is beyond kind and caring, there are separate waiting rooms for dogs and cats so that my girls don't have anyone barking at them, and every visit earns the kitties treats and even new toys. The sign outside says this place takes the pet out of petrified, and they honestly do go out of their way to do just that in a way no other vet I've ever had did." "Today, we went in for our first visit. Immediately I was pleased. There's a separate entrance and waiting area for cats and dogs. The vet brought in a pheromone covered towel and some catnip to put my kitty at ease. The exam tables are even heated! Everyone was so sweet and very kind. They listened to my concerns and the history of my cat. I am very grateful to have found Best Friends. We look forward to seeing them again! Great experience!"